If No One Read Me My Rights Will My Case Be Dismissed? I get this question every day. “If no one read me my rights will my case be dismissed?”. The answer depends on what you said, when you it and perhaps most importantly what the cops say you said. The rights referred to here are your Miranda rights. Everybody knows what these rights are however very few people outside of the criminal law profession know how they are applied. Hopefully this article will shed some light on the meaning of these rights and the actual application of these rights. Miranda rights must be given when someone is in custody. If you are detained by the police and not free to leave you are in custody. At that point, any questioning must be proceeded by a proper advisement of these rights and a valid waiver of the rights. 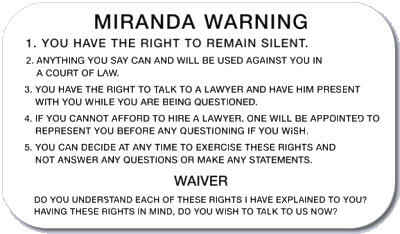 If the police simply ask you questions during the course of an investigation Miranda is not triggered. This is true even when you are a suspect in a criminal investigation. Oftentimes the police will visit you, unannounced, at your home or place of business. They might advise you that they are investigating an incident and want to ask you a few questions. Or, they simply might just start asking questions. In either case your Miranda rights have not kicked in. So, if you did in fact speak with them and answer their questions the failure to advise you of your rights is not fatal to the prosecution’s efforts to use your responses against you. Countless times in the past I have advised against every speaking with the police. Nothing good can come from it. You are not ever obligated to answer their questions and doing so can place you in great jeopardy. Some people think that they have outsmarted the cops when they speak with them without being advised of their rights. This is twisted, incorrect logic. Guess again. 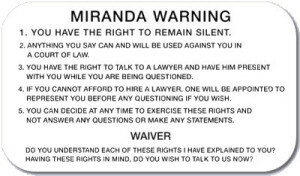 Anything you say, whether or not you have been given your Miranda warnings can and will be used against you. Here is something else to consider. No matter what actually happened the police can simply report that they did in fact read you your rights. What? You mean they can lie? Well, they shouldn’t but they do. You would be amazed at how many of my clients read their police report and are shocked when they see the phrase “and then I read the suspect his Miranda rights”, when if fact this never happened. This problem is usually avoided when you simply say nothing. If your Miranda rights should have been given and if they were not, any statement you made should be challenged. Your lawyer can do this by filing a motion to suppress your statements. When you win one of these motions all of the illegally obtained statements are excluded from the district attorney’s case. This can result in a dismissal of your case. Attorney Stephen Neyman has been defending people accused of committing crimes for nearly thirty years. We have an unmatched success rate. Call us at 617-263-6800 or send us an email. We can be reached 24/7. We can help you.